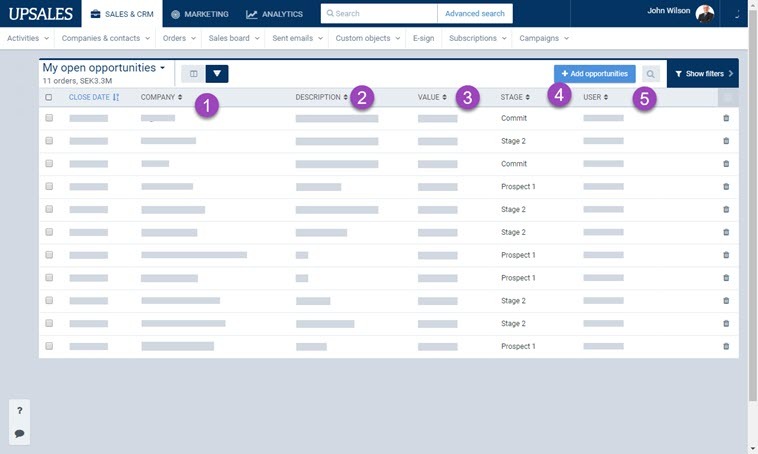 The Opportunities list helps you track potential sales. Opportunities also show up on the Sales board. This article guides you through the process of working with the Opportunities list, creating a new opportunity, uploading a file to an opportunity and creating a copy of an opportunity. Select the arrow next to Sales. 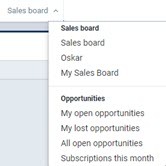 You can also access the Opportunities list by selecting the Opportunities tab from the top of the Sales Board. The list of opportunities you selected is displayed. The Opportunities list provides an overview of information about your opportunities. To find a specific opportunity in the list, enter the first few letters of the Company name or the Description in the Quick Search field at the top right. The row for each opportunity allows you to open, edit or delete the opportunity.